Saddle was new for "Christmas present" in December 2004. In March 2005 pony developed white patches behind wither. Tree is straight and sound. Panels straightened with strip flocking. Lumps eliminated with strip flocking. "Holes" in flocking behind points, leading to bridging. Holes eliminated with strip flocking. Stitching--knot 3/4 around cantle, leading to uneven tension on cantle. Linen thread at cantle, brown thread at pommel and quilting. 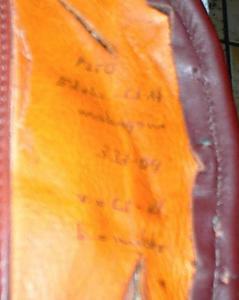 Fitter replaced with black thread. Flocking is grey with some multicolored dye. 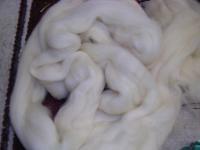 Wool is lumpy. Fitter replaced with 100% wool, cream colored (imported from England). Glue on panels below pommel has dissolved. Cork below seat unbalanced; left cork higher and larger than right. Tree should be level so rider can sit level, and put equal weight on each side. Off center panels and uneven tree (cork) likely contributed to rider sitting heavy to right. Saddle is now symmetrical, and should return rider to correct position. After a time of riding heavy to one side, rider should be aware that habit may have developed. Try to be aware of pressure on both sides and to counteract habit which may have developed. 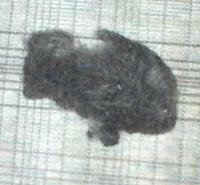 Examine pad after riding to look for: even dirt marks, any "clean" areas (bridging), even sweat marks. More dirt on one side or the other will indicate that rider is sitting heavy to that side. Tree is straight and sound. 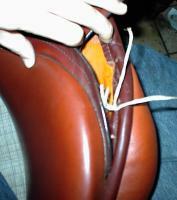 With even riding and proper care, saddle should remain straight. For first ten (10) hours of exercise riding, saddle should be used without pad to "bed in" flocking. Regularly compare horse's back to templates, checking for change. If horse's back changes, flocking should be tweaked to match.